I was recruited for UNNRA in 1944 and went to Granville in France early in 1945. We assembled into teams (a director, a doctor, a supply officer, a nurse, a warehouse officer, a welfare officer, two drivers and me, a messing officer; plus two vehicles (both ex desert campaign). My job was to ensure that the displaced persons had sufficient calories daily. Housing: We made our way going from point to point through Caen and Avaranches; it was difficult. We were in Paris the night that the war was declared over. We were instructed to make our way to Minden (Camp 158) on the Weser. It took maybe four of five days to get there. By this time the British Army were in control, the Town Major, Major Mark Stewart, met us. He said, "Any fool can be uncomfortable - go and see where you want to live. Don't tell them, come back here and I will sent two soldiers with you to requisition the house. They must leave immediately, taking only their clothes, cutlery and bedding - with the understanding that they could come back for any crop they had growing in the garden. " My group selected a house that seemed suitable; it turned out to be the Gauleiter's (German district administrator). We appointed his wife as our housekeeper. She got two friends to assist. Since it was her house, she did not want it to deteriorate and they kept it very well while we were there. 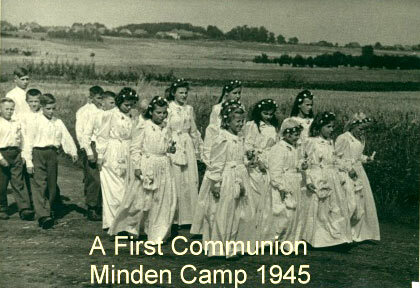 Communion dresses: One little story is that two of our drivers one Dutch and one Belgian were going for petrol (gasoline) and they heard German drivers talking of a haul of stolen property that had been hidden in the attic of a public house, not realising that our drivers understood German. The drivers came and told us, we wrote a requisition in English, stamped the document with the Gauliters stamps - all now meaning nothing. The drivers went to the public house with the document and demanded all of the property. The people in the pub gave it to them (rolls of lightweight material, ideal for making dresses and blouses). The drivers brought it all back. Then we put it in the basement of our house. The supply officer found someone who could make it into clothes on the understanding that the tailor had some of the cloth as payment. Some of the items were the First Communion dresses for the girls and shirts and trousers for the boys. Here is the photos of a group of children with candles, requisitioned from the British Army. The DP's of Minden made one of the huts into a church. This is the window that they made. 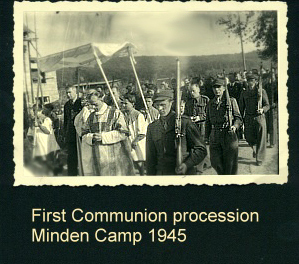 The priests came to the camp from Hannover. 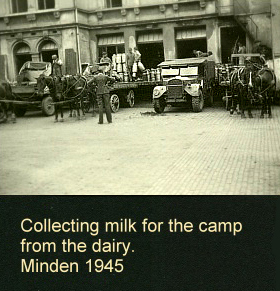 Minden, the first camp I worked at is towards the north of Germany, was simply the old army barracks . 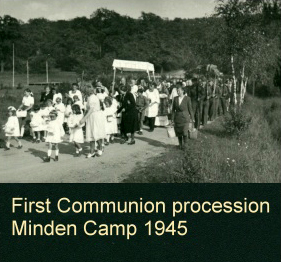 Minden was mainly a camp for people in transit; we did not really know how many were there at any one time. Menden is about 90 miles south. There they used the houses that had been previously used for married soldiers. Tea parties: One thing we organised were afternoon "tea parties" for women and children who needed extra calories. This was from American Red Cross parcels. It ensured the food went to those who needed it and did not end up traded for schnapps! Polish slave labour: The Polish DP's told the Military Government that they had been forced to work in a tunnel in the rock dealing with ammunition. They were poorly fed and treated. Many died and had been buried in a nearby field. Those who had seen this knew where they were. They asked the Military Government for permission to exhume the bodies for a proper burial. After the Poles insisted they should be the ones to do it, they were given the vehicles and tools. I can recall that they were working for two or three days. Milk: It was realised that the dairy were supplying milk for the camp that was about to turn sour. So after that, all of the milk in the churns was checked with litmus paper. 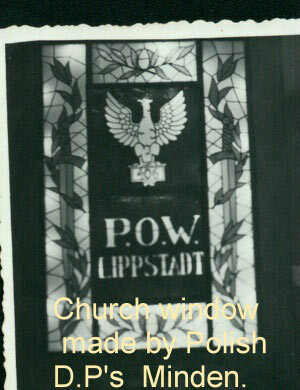 Later I went on to Camp 174 in Menden (where people were mainly settled in German Army houses) including two photograph albums made by the Poles and presented to me when I left.